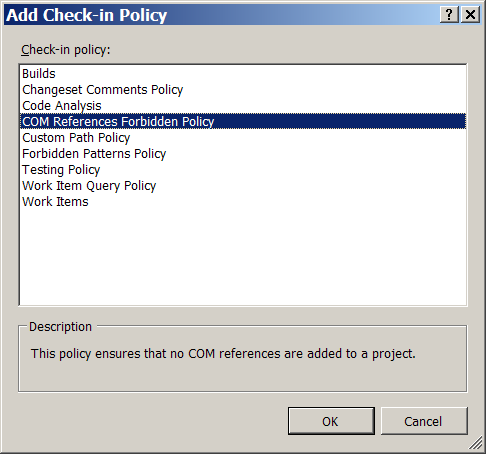 I have created another (hopefully useful) checkin policy for Team Foundation Server 2008 - one that checks C# and VB.NET project files for COM references. The idea came from a customer, where they require the developers to use "authorized" interop assemblies instead of developers recreating those by simply adding a COM reference to each and every project. And how do you prevent this? By having a TFS checkin policy in place. At first, I tried to load directly from the .? ?proj files, but Visual Studio (after thinking a bit about it it is pretty obvious...) doesn't like someone inside its process play around with the MSBuild engine. That's why I resorted to loading it indirectly. For installation I have provided checkinpolicy.reg, however, you must adapt the path to the .dll before importing it into the registry.